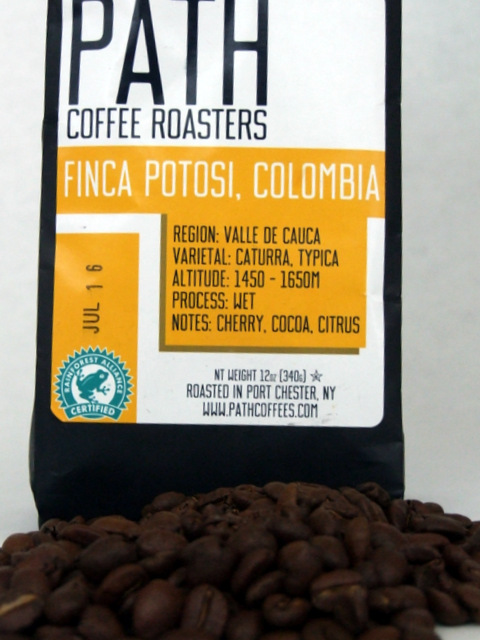 Today on the tasting block we have the Finca Potosi Colombian coffee from PATH Coffee Roasters in Port Chester, NY. 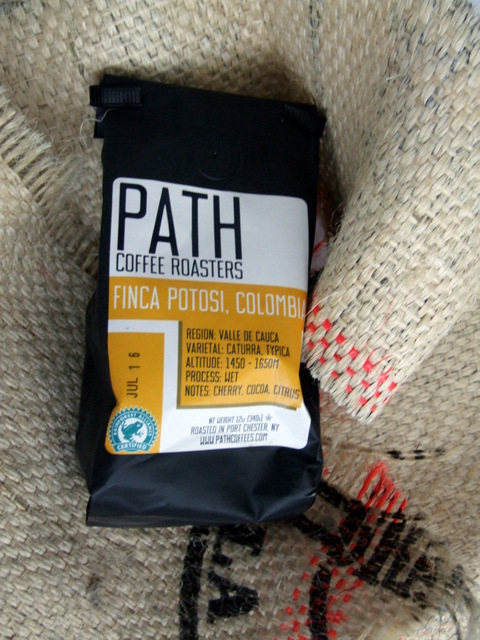 PATH is a 4th generation roaster focusing on roasting in smaller 30lb batches, with a special dedication to quality goods and ethically and substantially sourced coffee. The owners Jason Richter and Johnny Steverson have dedicated this business to putting forth only the best and specially selected coffee. 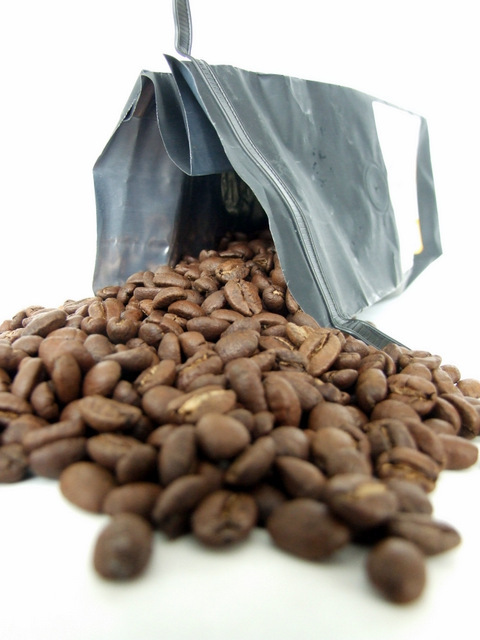 What makes Finca Potosi a special coffee? Well how often do you know the name of the family that farmed your beans? The Herrera family owned farm that produced these beans is lovingly nestled in the Valle de Cauca, and all of the coffee is grown between 1450m and 1650m in altitude. These facts to a normal person might seem like overkill. But to a true lover of coffee they tell you that not only is this coffee good, but you know why it’s good. The roaster even goes so far as to promote that the varietals of Coffea Arabica used to produce this blend are the Caturra and Typica types. Again a lot of information. And I was assaulted by the smell when i opened the packaging. (A small note about the packaging at the end of this) It was a deep rich smell with chocolate overtones and hints of dried fruit. Where the packaging noted cherry, cocoa and citrus I couldn’t disagree. Tasting this coffee is beyond beautiful an easy smooth mouth-feel and a full rich body. In tasting the coffee i had hints of the citrus and fruit, strong notes of cocoa, and a hint of toasted oats. A truly beautiful and bright cup. Next to no bitterness at all, a bright acidity. I can’t say enough good things about this coffee, It was heaven in a cup, and I can’t stop drinking it. This coffee actually gets 5 out f 5 beans. 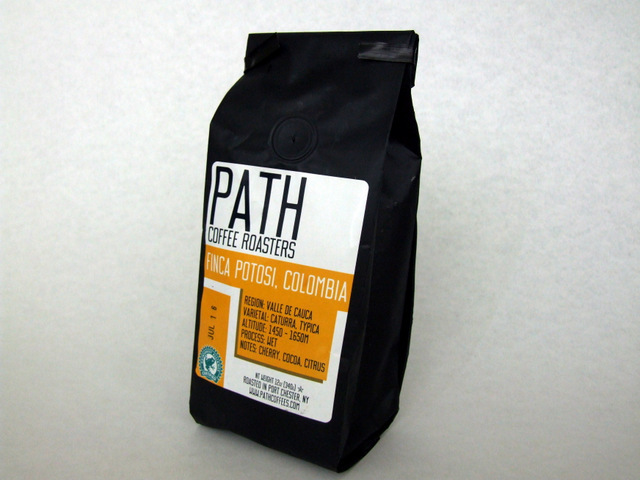 I can’t find a single fault with it, and honestly the sample not only turned me into a believer in PATH Coffee Roasters. But an admirer as well! Fantastic stuff! And it made good espresso… Is there anything this coffee can’t do? Check in next week when i pour it hot over a cut to see if it can heal it… Or not. Full disclosure: This product was sent to me at no cost for the purpose of review. It did not effect my review in any way.